The Archbishop of York said he was "deeply-honoured" to be made the first chancellor of a new university. Dr John Sentamu will take up the post when the University of Cumbria comes into being on 1 August. 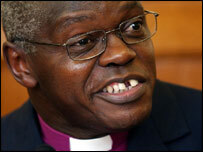 Dr Sentamu has been Archbishop of York since 2005 and prior to that he was the Archbishop of Birmingham from 2002. He has also served for more than 17 years as a parish priest and as chaplain to both a young offenders institute and a Cambridge College. He said: "I am deeply honoured to have been appointed to the University of Cumbria. "To be part of a university which will reflect the Christian values and the creative traditions on which it was founded is an exciting prospect. "I am looking forward to witnessing the flourishing of an academic environment where generosity and inventiveness combine with aspiration to produce a community of hope and learning." Dr Sentamu was born and brought up in Uganda and studied theology at Cambridge University before becoming ordained.